Appraisers differ on market size but Boeing’s new aircraft type could launch as early as 2026. Sept. 11, 2018, (c) Airfinance Journal: No announcement was made at the Farnborough Air Show about the proposed New Midsize Airplane (NMA). With Airbus’ A321neo model selling well, the ball is in Boeing’s court. The A321neo is Airbus’s weapon to challenge that market and the European manufacturer is trying to move fast into the middle of the market segment with more A321neo improvements in an effort to challenge further Boeing on its business case. The aircraft’s current maximum range is 4,000 nautical miles (nm), but Airbus is understood to be working on an improved version that would be capable of 4,500nm or more. This would enable airlines to operate the aircraft on transatlantic services to destinations further south on the US east coast and further east. Extending the range of the A321LR, among other things, could be the reason why there are delays in announcing the NMA business case. Airbus A321LR possible improvements might yet tighten the mid-market pincer from below but the Toulouse-based manufacturer has yet to convince the market with its A330-800neo. This has not gone unnoticed by Boeing, whose strategy will be pointing out the commercial difficulties of the A330-800neo. Appraiser firms believe Boeing will launch the NMA with an entry-into-service of about 2026-27. “Analysis of recent all new programmes suggest there is a typical seven- to eight-year development period between authority to offer and entry into service. So, if there is no authority to offer before the end of 2018, then the earliest entry into service would likely be sometime in 2026 or 2027,” says Flightglobal Ascend’s head of consultancy Rob Morris. He believes the Boeing business case is clearly sensitive to volume and price and a case both for “launch and no launch” can be made. Production transformation is very important in making the business case. “This could be key as the NMA could become an enabler for the production system for the next-generation single aisle aircraft, which is where the key battleground will be for Airbus and Boeing in the future,” says Morris. Angus Mackay, principal at ICF, says the size of the market is between 3,000 and 3,500 aircraft over a 20-year period. Dechavanne thinks more of a 1,000 to 1,500 aircraft market. Morris says the NMA market footprint will be highly dependent on the aircraft’s size and range, which appears to be coalescing about 5,000nm and 220 to 275 seats dual-class, as well as Boeing’s ability to manage unit cost and, of course, the competitive reaction from Airbus. Ascend believes there is an opportunity for the NMA to capture a significant share of the demand between 2025 and 2040. Dechavanne believes that the current and future improvements of A321neo and A330-800 models could cover the segment well, but he also warns should Boeing launch a new family of aircraft that replaces the top end of the 737 Max family, Airbus will need to react with a new family as well. The appraisers are divided as to which engine providers will power the NMA. Dechavanne sees Pratt & Whitney and Rolls-Royce being in the programme “as long as they can get their act together with their current issues”. Oriel’s Les Weal expects General Electric and another engine manufacturer. Mackay anticipates one engine provider only with the programme share risk: General Electric and CFM International. Weal expects NMA pricing to be in the $70 million and $80 million bracket, though he expects early orders to get significant discounts. “Having engine choice will help pricing too,” he says. Mackay sees pricing at about $75 million and $80 million net to airlines, with significant buyer-furnished equipment content. Morris says net delivered price will be in the $67 million to $82 million range. Dechavanne is at the upper range of the market with an $80 million and $90 million estimated price range. We seem to be remorselessly driving towards a conclusion that the NMA must be made. The logic appears to be that it is unacceptable to leave a segment largely dominated by Airbus. Well as that may be surely Boeing should be looking at carving out a market or creating models that have some appreciable chance of making a return. The NMA looks highly unlikely to be able to do so given limited overall market and the ever present A321 (in whatever guise) blocking the bottom end. Why are Boeing not addressing the elephant in the room. They have a one trick pony in the MAX 8, a damn fine trick at that. They could look to take the A321 market by developing a NSA at the top end of the single aisle (slightly larger/ longer than MC 21) with 1.5 aisles and pile it with a new engine and all the tech they can reasonably bring to the party. If Boeing keeps it simple with a metal fuselage that can replace 763F’s by 2028, carry ~260 pax 4500Nm with fair cargo capacity it will be the end of the 330’s in combination with 788/9’s. The market in the East potentially much bigger than North America. Increase pressure on airport on the ground turnaround times will give the 797 the edge in 10 years from now. At least prior to the FedEx nuttiness, the plans was minimal freight. Boeing’s proposed NMA would have single aisle sized cargo holds under the main floor; however, it would have 767 width above the main floor. It would thus have more cargo capacity than a 757-200, which is currently the most numerous aircraft type in both the UPS and FedEx mainline fleets. Operating costs, except for acquisition costs, would be lower than either a 757 or 767. The three most numerous aircraft types in the UPS fleet according to Wikipedia. The three most numerous aircraft types in the FedEx fleet according to Wikipedia. See below for UPS Freighter Cargo Capacities. UPS has had dedicated 757F all along. MD-11F looks to fly for another 20 years. It just does not seem a likely offering and seldom if ever is cargo the first variant for some time. And only in the real long term would it possibly be a cargo variant needed. Lots of 737-700/800/900 out there. The 757-200’s are currently the smallest and lowest payload aircraft in the FedEx and UPS mainline fleets. The next notch down in aircraft size and payload in the FedEx (Feeder) fleet is the ATR-72. UPS contracts feeder operations out to independent contractor owned aircraft instead of owning its own feeder aircraft in UPS colors; however, the UPS feed contractors use similar aircraft as those in the FedEx feeder fleet. As long as the cargo and package business is on the upswing, I don’t think it is very likely that FedEx or UPS will want to introduce into their mainline fleet any aircraft, such as 737’s, that are smaller than or have less payload than, what are currently the smallest aircraft in their mainline fleets, i.e. 757-200’s. I think it is far more likely that replacement aircraft will be larger than the aircraft they replace. With nearly 12 000 single aisle orders outstanding the airspace and airports are not going to get quieter in the next 10 years. Why do they have to stick to a metal fuselage? I too think that this is the right answer for B. A new narrow body (but a foot wider than 737!!!) with two wing sizes can cover everything from the Max 8 to the old 757-300 and with the big wing provide up to 5k mi. range. A much better idea; why won’t Boeing listen to you or me???? It is the low 737 manufacturing cost, its durability, its payload/range and still high lease prices. The Boeing beancounters does not want to kill its golden goose. Because unlike U and Sowerbob, even fluid dynamics engineer freshmen @ Boeing(Also their counterparts @ Airbus, EMB, BBD, Mitsubishi, Comac, Sukhoi, etc.) actually hv a basic understanding about how an increase in fuselage cross-sectional area and in total fuselage skin surface area can exponentially increase aero drag(let alone weight)….especially inefficient when such a larger fuselage is NOT accommodating more seats per row than any 320/737 family in production. Bjorn of leehamnews.com hv been explaining this in great details on this website earlier this yr. So instead of listening, perhaps more reading will be more productive in understanding “why won’t Boeing….”. Yes, well, I think the considerations one makes over fuselage widths come out firmly in favour of something fatter than the 737. Perhaps not 1 whole foot, but not nothing. A320 is already 7″wider, MS-21 another 4″ beyond that. The A320 is already 7″ wider and the MC-21 another 4″ beyond that. I was looking for a solution to not going for twin aisle whilst still offering faster ingress etc. You seem to suggest the B737 sizing is sacrosanct when I see it as an anachronism. The wide aisle solution would provide that bit more space without the jump to 7 across. Thanks Scott, last couple of days the NMA has been mulling in my head again. From a Boeing angle the problem is trying to compete with the 321’s and then also to give it good range and capacity. To compete with the 321’s BA needs an FSA/NSA, but also don’t try to give the NMA 787 capabilities. My take (at the moment) very much in line with what you mention above. In many instances twin aisles have a “champion” model with other variants not selling well. 260 seats, 4500-5000Nm range, engines 50-55 Klb, 50m wing, OEW 80-90T, LD3-45’s, etc. Airbus has nothing for a long time that will be able to compete with this, also in the East, nothing between the C919/MC21 and C929’s for a very long time. What you describe is essentially the gap that the A321neo cannot cover in its current or future shapes that don’t require significant investement. This has basically been the gap (with some blurr around the edges) from the start. Big issue is: You don’t just need to define a gap – you need to show that there’s enough demand to actually fill that gap. Especially enough demand to justify developing a new plane. The last six and a half years, Boeing has not been able to make that business case. One supposes from the non-appearance of a public proposal, there plainly isn’t a market demand big enough. I’m not sure that Boeing have the right carbon fibre technology, whole fuselage barrels. Sounds expensive to develop a new aircraft. The methods Airbus used on A350 sound much more efficient to build a new model. That might mean Airbus can fill the NMA gap with a CF airframe, and Boeing cannot. Does anyone think that that explanation is anywhere near the mark? The Boeing way of designning full barrell sections in CFRP is quicker to make and gives less distortions when autoclave bake in huge autoclaves. The Airbus method of panels is harder to make but can easier be spread among many suppliers and the size of autoclave dont’t need to be as big. You can staple fuselage shells into the medium size autoclave and bake the whole lot at the same time in theory. Think Airbus has 4 sections per barrell. with an efficient airframe that can be produced in a competitive way. I still see that “uncanny valley” between NB and WB layouts. Only the “geographic” position has moved slightly up (capacity) and vastly out ( range). March 2012 was the first time Leeham reported that Boeing was still working on an NSA, but in the guise of a 757 replacement, rather than the 737 replacement that was no longer needed after the launch of MAX. MAX had been launched about seven months prior to that article, and the A320neo about 20 months prior to it. This is now exactly 6 1/2 years ago. What we’ve seen since then is the launch of the 787-10, A330neo, the EIS of the A320neo, of the 737MAX, of the A330neo (all three hampered by engine OEM issues), and of the 787-10. We’ve also seen dozens and dozens of articles about how customers are pushing for that NSA/MOM/NMA. About how Boeing was expected to launch it at or maybe at the . What didn’t materialise was the actual launch/authority to offer. Instead, the A321neoLR was offered (in October 2014), as was the 737-10 (in October 2016). Recently we’ve seen an increasing number of reports that state what should at this point have been clear already to most observers: It’s very tough to actually make the business case work. To be quite honest – I think the window of opportunity has passed. Maybe it was never really there to begin with. MOM could be made workable by _attractive features that can not be applied to larger frames_ . ( absence of those features being IMU the reason why the smaller widebodies lost market interest. new features PLUS scaling advantages is just too good to walk away from. I think there is a segment and I agree with Dechavanne is should cover top MAX/A321 segment. Reality is A will spit out 300-400 extra A321s per year until 2024. So that pushes up the specification of the NMA. Trying to make a twin aisle work short haul apparently didn’t really convince the airlines so far, reducing fleet network flexibility of a big NMA.. not easy. As I recall, you said the 787 wouldn’t convince the airlines to switch to either. 787 was sold on price. filling the books up front. Then a long period of cancellations evening out new orders. A new type that sold in a limited batch. Recently we saw renewed interest …. again apparently based on pricing “you can’t walk away from”. Synopsis: few things that don’t gain sales from low pricing. again Boeing apparently sells below cost. While a cheap-to-develop A321XLR will further weaken the business case for the NMA, Airbus could potentially choose to develop a common next generation composite wing for the existing A320/A321 — i.e. a wing not just for the A321. The basic planform of the current wing could be retained — in order to prevent changing the geometry of the centre wing box. Furthermore, the wingspan could be increased by some 6m over that of the current wing — i.e. by introducing two 3m downward folding wingtips. However, the width at the tip of the outer wing box would need to be increased. That could be done by tapering the outboard aft spar with a greater relative sweep angle. By having a kink in the aft spar at RIB 22*– i.e between the flaps and ailerons — or, just like it’s done on the A330** and A350*** wings — the outboard wing chord at the junction of the folding wing tip mechanism, would be greater as the relative sweep angle of the installation of the ailerons on the trailing edge would also be increased (i.e. 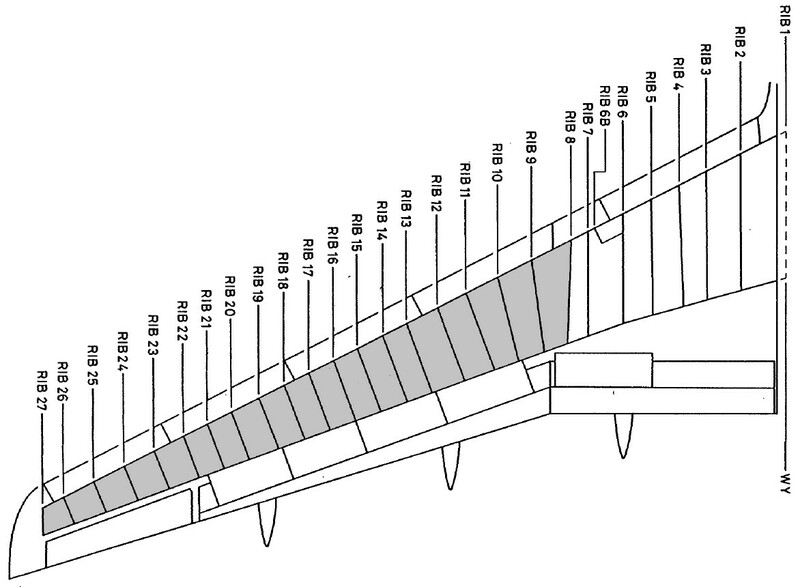 greater relative sweep angle of the trailing edge of the ailerons). Hence, the current wing planform seems to be good for a roughly 6m increase in overall wingspan. Lift induced drag would decrease by at least 20 percent. Add laminar wing panels (natural laminar flow) and all new UltraFan engines, and you’d be looking at a relative fuel saving upwards of 25 percent. Even a stretched A322NG featuring that kind of wing and engine would make life miserable for any NMA and the current MAX. EIS in 2026? Downward folding wings like the downward ejection seat is a dead (literally in the case of ejection) end. As an old engineer I think not. Naturally safe in the air. Good option. I agree simple fail safe design is sensible. I would hope though that the wing extensions are only unlocked to fold down once the aircraft has all wheels firmly on the ground. You really wouldn’t want to be worried about wing extensions in close proximity to the ground while landing in a severe cross wind. I would be very surprised if a NSA from either Boeing or Airbus didn’t feature a wingspan over 40 metres (131′) with an aspect ratio closer to 11. 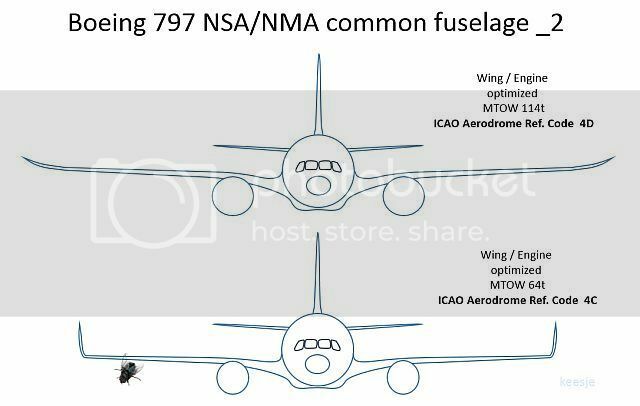 Of course when discussing the NMA how do Boeing reconcile a design that replaces both the 757, and 767 with wingspans of around 38m , and 47.57m respectively ? Doesn’t the NMA have to be either a 737 MAX 9, 10, 757 replacement, or a 767, 787-8 replacement for the business case to make any sense at all ? The wing tip only folds down during the latter part of the landing roll. In contrast to the folding wing tip on the 777X — which has to be fully deployed before the aircraft enters the runway — the downwardly foldable wing tip device is extended or retracted only during take-off and landing. The operation of the device is fail-safe, so the pilots don’t have to worry about whether or not it’s extended or retracted. From page 10 in the patent application: For landing the process is reversed. Namely the lock is disengaged (for example at the same time the landing gear is deployed). As the angle of attack of the aircraft decreases as the nose is brought down, the lift/drag forces on the wing tip device decreases to the point that gravity overcomes it and the tip returns to the ground configuration. In this scenario it is not actually necessary to use the actuator at all. Since the wing is swept, the hinge line is thus at an angle to the direction of flight. The wing tip device therefore presents a larger frontal area when it is on the ground configuration than when it is in the flight configuration. During forwards motion of the aircraft, the pressure drag acting on exposed surfaces of each downwardly extending wing tip device, moves the device away from the ground configuration and towards the flight configuration. As the device rotates upwardly these forces continue to urge the device upwardly, but the wing tip device also starts to generate its own lift which also contribute to moving the device towards the flight configuration. Such an arrangement has been found to be beneficial because the actuator for moving the tip device can have a relatively low capacity. Specifically, the capacity can be less than that required to move the wing tip device from the ground configuration to the flight configuration in the absence of the aerodynamic forces. The actuator can therefore be relatively small and light. For take-off, the wing tip device is first configured in the ground configuration. The aircraft then commences the take-off run. There’s no lock on the wing tip device in this configuration, and the hinge is sufficiently free-moving to allowing the wing tip device to rotate from the ground configuration towards the flight configuration by virtue of the drag acting on the device. As the speed of the aircraft increases and the device rotates upwardly, the drag decreases but the device begins to generate sufficient lift to assist in moving itself to the flight configuration. The actuator is also used to assist in this movement, until the wing tip device reaches the flight configuration. At that point, the lock is engaged to prevent the wing tip device falling back down under negative-g flight conditions. For landing the process is reversed. Namely the lock is disengaged (for example at the same time the landing gear is deployed). As the angle of attack of the aircraft decreases as the nose is brought down, the lift/drag forces on the wing tip device decreases to the point that gravity overcomes it and the tip returns to the ground configuration. In this scenario it is not actually necessary to use the actuator at all. Agree, don’t think their is a middle road here. The 797-6X is described as having 225 seats with 225 seats, that’s a compromise. See a champion model as seating 240-260 seats with 4500-5000Nm range? There is nothing more safe about downward than upward. The locks work or they don’t. Part of airlines assessment of winglets was the damage they would receiver on the ramp. And those don’t hang down nearly as far as the proposed downward thingy. I agree that the evlution of the A320 with a new Composite wingbox+wing and RR ultrafans on the A321ULR /A322 shounds logical. Still Airbus might be locked into old agreements and the fear that the Boeing 797 will be even better and cheaper if Airbus show their hands to early. But designing the A321MAX like above is the cheapest and quickest way forward and will force Boeing to increase the price on the 797 as its sales volume will shrink. Airbus can work hard to reduce the empty mass and MTOW on the A330-800 and derate its RR Engines alot making it a very durable (but still heavy Aircraft) to work its way into a big MoM Aircraft. Airbus‘ Filton wing facility is where the magic happens. Wings are designed, tested and built there, and the factory holds many dedicated engineering teams under its belt. “The Wing of the Future” is currently being designed at this very facility. Using advanced 3D modelling. virtual reality and new methods of team contributions, Airbus’ Filton plant has arranged a wing for future narrow body aircraft such as A320 family additions or a totally new family. Typically, the A320 family has been quite limited in terms of wing performance. With the Boeing “797” slowly entering reality, Airbus needs to fight with an aircraft that’s new enough to compete. With this in mind, neither of the companies want to build a super advanced aircraft like the 787 and A350. Boeing has stated many times that the aircraft will not include groundbreaking features and Airbus is already stating the A321LR is enough. Airlines however are not sold on this, hence the recent developments from both sides. The proposed A320 family addition Airbus is studying is expected to feature this new folding wing, which Filton says will be in production within the next 10 years. Airbus and the wing design team are targeting a wingspan of around 40-44 meters – a significant increase from the A320s 36 meters. Engineers are currently working on performance figures and have so far agreed on a 12% reduction in drag. Interestingly enough, despite the folding wing being similar to the Boeing 777x, Airbus has elected to go for a downward facing design. The idea of having the fold pointing down means lighter locking systems and mounting points in the wing. Why? Because as lift is generated, it forces the wing into place. If the navigation lights are positioned on the wing then there will be easier maintenance if one of them fails. However, there is one issue that has been brought up and that’s the ground clearance. The wing fold would be limited to whatever the height is at the end of the wing and whether it will scrape the ground or any vehicles in the area. The role of an engineer is to overcome a problem but nothing has been mentioned about what’s planned for this. Wing manufacturing processes will also have to be overhauled. The new technology, production ramp-ups and the use of composites means new equipment and possibly new factory locations. With Brexit pushing Airbus into panic mode, countries around the world are already in discussions to take over wing manufacturing should Airbus walk out of the UK. Spain has large amounts of expertise in composite parts for Airbus and is currently a location on the board. Other countries include Germany, France, China and the United States. WILL IT BE FOR AN ENTIRELY NEW AIRCRAFT FAMILY OR WILL THEY PUSH THE A320NEO FAMILY SOME MORE? Very good point, can see an A321XLR and A321+/(322) using a tweaked wing for ~100T MTOW as bridging models. If BA launches an FSA same applies but we could also see an A320+ with the XLR’s tweaked wing? End of the day if the XLR can fly 180-200 pax 4000-4500Nm “with ease” it will be very competitive. ….but it won’t solve AB’s 250-300 seat twin aisle “crisis”. You get really suspicious as a technician when they say it would make replacement the wing lights easier, Wow, that has got to be what the 2nd largest cost other then fuel? And in 10 years? Really? That soon? Boeing did it in 2 years for the 777. Weight saving? Ok, the downward lock as to be as rigid as the upward, its called downdraft, don’t matter, one way or the other the wing tip has to withstand all the dame forces. Once upon a time ground crews had 4 engines and props to avoid. They’ll get used to it. Paint the tips yelliw and put a yellow light on them to start with. Ground crews used to have four engines and props to avoid. They’ll get used to it. Paint the tips yellow and put yellow lights on them to start with. Well that was like 50 years ago wasn’t it. Nice slow pace, not the madhouse you see now. And you know people ran into those props with things. Talk about causing a hindrance to operations where you are more redistricted at engine and wings. The key is that both A320 and A220 series have the same span- which is a limitation from the standard gate size at most airports . While some changes are necessary these are mauch easier to accomplish with an existing wing architecture rather than the time and investment and testing for a completely new wing. Maybe some extra area near the wing root and a change in profile ( the ribs are aluminium anyway) and different flaps. often a large investment is needed for the carbon wing production with autoclaves etc. These exist for this size of wing in Bombardiers Northern Ireland factory. Its a huge advantage in time and money to give its A320 series a new lease of life and keep as much of the existing plane as possible. Boeing cant make any more changes to the structure of its 737 series as they dont bring value for money like a new engine did. Boeing is a bit stuck as Im sure they would love to put an ‘out of autoclave’ carbon wing into production for a new NMA. But that has only been done by the Russians for the MC-21, and thats probably not full production volume ready. The political situation doesnt allow a Boeing – Yakovlev tie up!! To me it is clear the Boeing management grossly underestimated the developing demand for bigger NB’s. Randy extensively explained their position 8 years ago, how they were right and had the best product to replace the 757. They were listening to nobody. Soon after airlines ordered 1000 NEO’s and AA jumped ship. Since then they have on the defense, fighting an uphill battle in shrinking market niche. Interesting its CFM that is causing Boeing pain not P&W! Will just have to wait and see on the NMA. When you have a business case for a clean sheet aircraft that appears to be marginal at best, factoring in a time horizon through to 2040 makes it an even bigger gamble as it is impossible to predict with certainty how the market will pan out over the course of two decades. That is a long time over which market changes, emerging technologies, and competitor responses can put a dent in the ROI of the project. Just look at the A380 prospects when it was conceived two decades ago and how things have evolved since then. I was reading some British aviation magazines from 1968 that I bought up. A Story about the US civil aviation industry shows some things dont change. Cash is short for Boeing as it gears to build the new order rush for the 747. Theres a delay in engine deliveries for its 707/727 engine deliveries impacting customer delivery. The new 737 hasnt sold as well as expected. The ‘cash shortage ‘ is holding up approval to offer and put into development the new 757 . You are in a similar position now that you need a new 45-50k Engine, but flying a windebody short hops as well require a reliability of the new Engines the JT9D-7AW never was close to. Boeing and its customers want a Composite light aircraft that can run 15years Before a Heavy check and can be sold/lease returned just before that. In addition super efficient Engines that will stay on wing for 20 000 cycles. The fuselage without Engines/APU and BFE’s might sell for $75M but then you need Engines/APU’s and BFE and that will cost you almost the same for the peformance/quality they want. Just look at PWA now trying to get the PW1100G to stay on wing more than 1000cycles. They will need to work hard to get that “easy” Engine to reach 20 000 cycles on wing. Just imagine doing it with even better SFC on a brand new 50k Engine. Boeing has lead in widebody sales and Airbus in narrow body (generalizing). With NMA wouldn’t it take some market/sales from wide body sale. Currently narrow body doesn’t have range so wide body are used to fill the proposed NMA spot. NMA will take more sales away from 787/330/777/350/330neo but not much from 321neo as it doesn’t have the extra range to begin with. I see some 787 sales lost to NMA. 330neo might suffer but it isn’t a new clean sheet. It is very likely Boeing will have 787 and NMA fight for same sale. Most airlines don’t buy single role aircraft. The NMA will be a “nice to have” aircraft with for many reasons, but does BA need it in its line-up, the 787’s more that account for the A330NEO’s. They could even consider an B787 in size between the 788 and -9 (260 pax) with lower MTOW and shorter range (5500Nm? ), GEnx engines could potentially be optimized/modified for such missions (60-65Klb?). Believe an “B752-X” with new CFRP fuselage taking LD3-45’s and composite wing (folding wing tips?) with a range of ~4500Nm (220pax) is much more needed by BA. PIP’s to the current LEAP and PW1100G engines should be a simple engine solution that reduces risk and time to EIS. The MAX8 & 10’s could eventually be replaced by an NSA using the same fuselage and when next generation engines are available. Probably Boeing needs to shrink / lighten up the NMA concept into a large NSA. And burry the twin aisle for the price of a single aisle non sense. Maybe CASM if you squeeze in 322 passengers, but that’s what nobody is asking for. Just looking at oil prices today airlines could want an 787-8 size twin aisle with range of 4500-5000Nm but it has to weigh (OEW) 20-40T (~25%) less than the 788 and requires newer more fuel efficient engines with less thrust (45-50Klb). Such an aircraft will cannibalize 788 orders but strengthen the NMA business case. I Think the 787 is a tad “too fat” for the MoM role, if they go down to A330 cross section they still fit 2ea LD3’s and a nice seating of 2-4-2 in addition to reduce mass, cost and drag. From a pax and aerodynamic efficiency point of views the 2-4-2 seating probably the optimum for aircraft between 250-300 seats? In my opinion, unless a Boeing NMA replaces the MAX9 and 10 at the lower end, I just cannot see a sufficiently large market for NMA. Certainly Airbus will not be a passive observer with some of the options for the 321 mentioned in this thread almost certain to be implemented as a counter to whatever BA eventually decides to offer. 2. There is no infrastructure and no production system to make a low-cost CFRP fuselage in the US today. Boeing may have tried to find a supplier, but probably failed. This means R&D can’t go further than concepts. 3. Same with the engines: As there is no engine available and not even in development, development for the plane is stuck too. 4. Production cost of a full-carbon 797 will be very close to the 787-8, above a A330-800, while the payload and range will be much less. And that’s where the pen drops and the business plan and sales prospects begin to look really ugly. 1. Yes, the closest is the super guppy that took a major load thru the floor. 2. That’s why Boeing is so dependent on Electro Impact tooling and Witchita to produce fully complaint composite structures quickly and cheaply. 3. It depends how good Engines you require, GE could reuse the core of the GEnX-2B and have Snecma designa new LP system with GE looking over their sholders. It will be on time and cost but nothing like a RR Ultrafan. 4. Yes, unless the CFRP automation suppliers like Electroimpact and M Torres really can deliver machinery to reduce proeduction cost. the Super Guppy actually has a round second fuselage fitted on top of the bottom primary fuselage. The key difference will be that the freight space was not pressurized. The pressure at altitude is what ads significant stress to the ovoid fuselage. The flatter upper end of the fuselage will want to bulge out (simply put) and thus has to be stiffened to counter that effect. No matter how stiff you make it, you will also experience elastic deformation during every flight, which does have quite a big influence on durability. This means you might need even more reinforcements. Manufacturing the 797 just like the 787 will no work, as production cost may be close or even above the projected sales price. It follows that as the 797 has to have an oval CFRP fuselage, they need to invent a new production system. Electroimpact will not do it for them, neither will Embraer. The 797 will need really good engine, actually will need a next generation engine to make ends meet. Trouble is that there is no geared engine in that thrust range available and all engine makers very busy in managing their current sets of problems. In this case the table is turned and Boeing might have to come up with support or even money for the engine development. The same would be true for the fuselage production. Boeing would have to come up with the risk capital to get suppliers involved. You think that’s going to happen??? Boeing rolls their own fuselages for the 787 so they would not be looking for a supplier. No reason you can’t do a mandrel that is ovoid, the frame links would be the same. The issue is cost, out of auto clave might be a way that allows that. Possible to do the Airbus method if it meets the same cost reduction requirements (granted Boeing would have it so fluffed and spun you would not recognize it as the Airbus system). There is a hole in capacity between the A321 and A338 of about 50%, so I think there is ample room. As far as the market goes, I think the upper limit is less constrained. A twenty year market of 3,000 on the low end, or 6,000 on the upper end if things go well seems realistic to me. There wasn’t a very big market for SUVs, until they were offered. If the 1985 to 2005 market for the NMA was 2,000, 40 years later with 4% growth, the 2025 to 2045 market would be 10,000. Really surprised at the direction the discussion is taking. Everything seems to point at the middle of any given parameter and not where the weaknesses are with the current product offerings. My view is that range is key. The A321 XLR parts bin special is credible because it offers more range not more floorspace. Any new platform — range is key. Currently there is a huge gap. Want to fly 4000 NM — You need to finance 50T of aircraft. Want to fly 4001 NM — You need to finance 125T of aircraft. Always a big hole in capacity between the A321 and A338, more than 50%. If the mid market 1985 to 2005 was 2,000 aircraft, 40 years of growth at 4% yields the 2025 to 2045 period at 10,000 aircraft. Working against the NMA is where to park it at airports with a large wingspan. But this will be the challenge for the NSA as well, as certainly any new A321 size aircraft will have 40m wing. The 763ER has an OEW of 90T (260seats, 6000NM range), that’s 30T less than an 788 and 42T less than the A338. Build an 797 with AL-Li fuselage using automated processes learned from the 777X, CFRP wing, new engines and you could have a “low risk” project. Engines most likely the biggest question. This aircraft could potentially be used to replace 767F’s and tankers in future. I agree. One has to wonder if a circular Al-Li fuselage is still in the competition with a CFRP lower ovoid fuselage. If the formula works for the 777, stick with that. A310 at 80T was 5150nm. A nice mid-market model. But I think that ship has long since sailed. A310 with up to date engines would be a 7000nm plane today, wouldn’t it? Possibly yes. But probably also 90T with modern engines and other equipment. Would expect any A310 clone released today to be lighter than the original. Engines will be heavier but modern materials and 40 year better engineering would mean that the rest of the aircraft would be lighter even without going to composites and anything extravagant. Not sure where the sweet spot would be for any re-incarnation of the original A300 fuselage CSA with a newly engineered composite wing and wing box? 90T OEW = 63M fuselage and 6K NM nominal range? 75 / 80T OEW = 58M fuselage and 5K NM nominal range? The A310-300 is not 90t but 80t today. If optimized for 5000NM range, with modern engines, fuel capacity/ wings could be even smaller. Still 8-9 abreast and fully LD3 capable. Time to bring back an old idea. That, to use 3 existing 737max engines for the NMA. Or even consider 3 PW 320 engines. It derisks engine supply and allows the airframer to focus on the core design. B has experience in triples, use it. I suspect the engineers that worked on the 727 (or even the DC-10/MD-11) have long since retired. 1) today’s engines are much larger than the old low-bypass engines. Very difficult to fit them in the tail cone or fin. 2) lots of extra cables and pipes along the fuselage ad significant weight and cost. 3) the tail engine is really difficult to service or replace. I feel that if Boeing needs a real competitive aircraft to get a good share of the market. Ignoring the A321 didn’t work. – Twin aisles will always compromise cost & efficiency at the bottom of the NMA segment. – It’s hard to design something efficienct for both 200 people on short flights and 250 people medium haul with 1 body/wing design. – Wings, engines and landing gear drive weight, performance and cost more than fuselage. Maybe Boeing could focus getting a common fuselage/cockpit, systems and create 1 fully optimized wing/engines etc sets for specific 1500NM. I enjoy discussions around the NMA, responses are many and good. From this its “clear” to me that many (including me) are not certain as is BA about the merits of this aircraft. That AB needs a new 250-275 seat twin aisle and BA a new 200-220 seat single aisle is “fact”. There is always the long running suggestion that the NMA is really a squirrel to cover up the real story in all of this — a new SA platform / architecture outflank the A320 for good. Consequently a MC-21 rivaling fuselage and big wings to open up the Super Sixty marketplace with the possibility of more to come. Knock them out at 10 or 20 a month and then offer a thrifted / reduced version to man mark the A321 product space. Then when the risk has been knocked out the programme you can up the volume and go after the 200 seat LCC market. Finally you can work with your new buddies south of the border to develop a real C Series competitor to cover the the markets lower down. Huge undertaking stretching out 20 years to cover the full 100 to 300 seat high volume / low cost SA marketplace. As is the case when eating an elephant — better to do it one leg at a time. The next step is the engine offering — 45K lbs thrust has been talked about and any new design will need to be a trade off between existing SA offerings and TA models which is a tough gig for a Big Auto type of guy. One can always dreams 🙂 IMO a moonshort bigger NSA would be a good plan for Boeing. Back to today; cold day in hell before they’ll admit, but are completely overrun in the 200+ seat NB segment. It’s worse than the numbers suggest (there appear to be 3000 A321’s in the NEO backlog, not 1800). With the latest NMA launch delay, I wonder if Boeing can continue preventing United Airlines from buying A321NEO’s. It is becoming a defensive option for United. The NMA is timewise rapidly moving out of the 757 / 767 replacement cycle at Uinited, American and Delta. Those simply can’t wait for 2026 for a first NMA.